Grand County is a paradise for many reasons. Year-round it brings people from around the globe for the various seasonal activities offered here. Gorgeous hiking and riding trails in the summer, fly fishing almost year round, skiing and snowmobiling through the winter and in the Fall? Hunters come from across the country to get “lost” in the woods for a few days. Now we realize not everyone is in to the whole “hunting thing”—we have a few vegetarians around here ourselves—but we respect those who hunt by the law in order to provide food for themselves and families for the winter. There is something to be said about naturally lean red meat—AND I guess we could call it organic. No added hormones here. And when you can provide all the meat for a family of four for the entire winter for under $50? Hard to argue it’s not a good option for those with the ability. A few of our Bar Lazy J family members take to the woods every Fall and this year was a bountiful one for them. 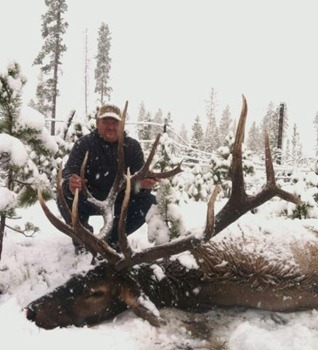 Ron and his nice 6x6 bull elk. 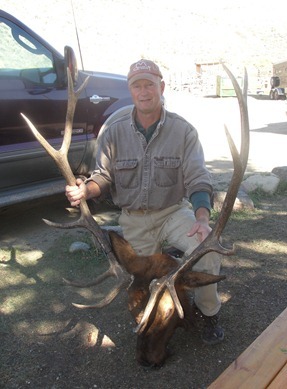 Shane (our farrier) and his humungous 7x6 bull elk. 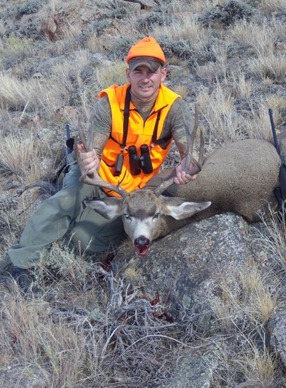 Chad and his large 5x5 Mule Deer buck. And now that the meat has been hung and then processed (yes, they do it themselves—only way to save that money! ), it’s time to pull out the Wild Game recipes for some of the tastiest dishes around. We thought we’d share a few of our favorites and keep in mind—these can be used with beef as well, but since deer and elk have little to no fat, using beef might be a little different. With that said, here are some tried and true delicious recipes from our hunters—they are sure to please! Microwave Venison Chip Dip This is super fast and a HUGE crowd pleaser at gatherings. Easy to substitute any ground meat including turkey and beef. We give this recipe away a LOT. Makes about 3 cups. 1/2--1 lb. of ground venison/elk (depending on if you want a “meatier” dip) 1 lb. Velveeta cheese with Jalapeno peppers, cut into 1-inch cubes 1 cup chopped, seeded tomato (or equivalent of drained canned tomatoes) 1 can (4 oz.) of chopped green chilies, drained 1/4 c. diced black olives 1/4 tsp. EACH of ground cumin and garlic powder 1/4 c. of green onions (I have left these out when I didn’t have them on hand and it’s still perfectly delicious.) In a 2 qt. casserole dish, microwave the venison on high, for 2 minutes at a time, until meat is no longer pink. Stir in between. Drain if needed. Add the rest of the ingredients and microwave for 2 minutes at a time until cheese is melted. Stir in between. If desired, you can reserve some of the tomato and green onions as a garnish to put on top afterwards. Serve with your favorite tortilla chips or use as a potato topper. It’s a winner! (*Make a double batch and put it in a crock pot for your next potluck appetizer dish . You can thank me later! *) Cranberry Elk and Rice 2 T. of vegetable oil, divided. 2 lbs. Elk top round or substitute, cut into 1 inch cubes 3 medium onion, each cut in 8 wedges 2 c. beef or venison stock 1 c. dry red wine 2 T. balsamic vinegar 3 cloves of garlic, minced 1 tsp. dried thyme leaves 1 tsp. salt 1/2 tsp. pepper 1 package (12 oz.) fresh cranberries 1/2 c. packed brown sugar 1/2 c. flour 1/2 c. water Rice In a Dutch oven, heat 1 T. of oil over medium-high heat. Add half of elk cubes and cook for 4-6 mins until no longer pink, stirring frequently. Remove with slotted spoon and set aside. Drain pot and repeat with remaining oil and elk. Return meat to pot. Stir in onions, stock, wine, vinegar, garlic, thyme, salt and pepper. Bring to a boil over high heat. Reduce heat to low. Cover and simmer for 1 hour or until meat is tender, stirring occasionally. In medium bowl, combine cranberries, brown sugar, flour and water. Stir into meat mixture. Cook for 5 to 8 minutes, or until sauce is thickened, stirring frequently. Serve over rice. Yum! Four-cheese Pasta 8 oz. penne or other tube pasta 1 lb. ground venison or elk (we use our homemade Italian sausage—recipe follows) 1 (14.5 oz.) can stewed tomatoes 1 (8 oz.) can tomato sauce 1 tsp. garlic powder 1 c. sliced green onions 1 (3 oz.) package of cream cheese 1/2 c. shredded Parmesan cheese 1/2 c. shredded Swiss cheese 1/2 c. shredded sharp Cheddar cheese or cheese of your choice Cook pasta as package directs; drain. In skillet, brown venison. Salt and pepper to taste if meat is not already seasoned. Add tomatoes, tomato sauce, garlic powder and cook uncovered, until slightly thickened. Stir in onions and cream cheese. Toss with remaining ingredients. Cover 5 minutes to melt cheese and serve over pasta. Pass the garlic bread! Italian Game Sausage 3 lbs. ground game meat 1 lb. ground pork (for more “leanness” and less “sausageness”, nix the pork and use 4 lbs. of game meat. Still delicious.) 2 cloves minced garlic 2 tsp. fennel seeds 1 T. salt 1 T. parsley 1/2 tsp. fresh ground pepper 1 tsp. crushed red chili peppers 1 T. Italian seasoning 2-3 teaspoons of cayenne pepper (optional for hot sausage) Mix all ingredients and blend by hand. Roll into 4 equal balls and freeze in 1 qt. freezer bags or freezer paper. Don’t forget to leave one ball to use fresh! SO good! Enjoy! 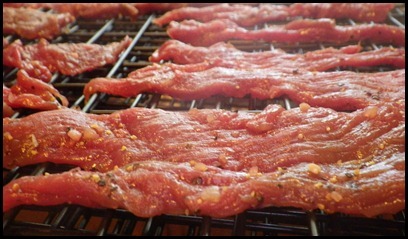 We’re off to make our most favorite wild game dish—essential for hikes and all-day riding expeditions—jerky!